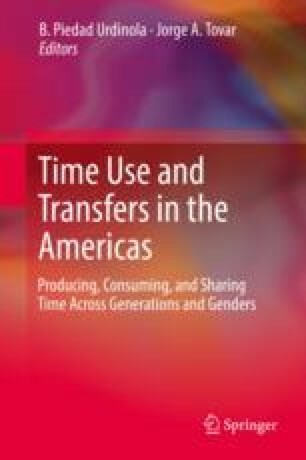 Exploiting the standardized methodology described in chapter II, this chapter portraits similarities and differences of time use accounts per gender across the countries included in this book: Colombia, Costa Rica, Uruguay and the United States of America (USA). A common finding is that, despite the differences in development levels and population size, men devote more time to paid work than women, who in turn dedicate more time to unpaid domestic work. The value of unpaid domestic work, around one third of each country’s GDP, is not negligible in any of these economies and calls for policy action to account for this significant portion of the economy. Detailed analysis finds that in all the sample countries there is no gender gap in educational attainment until age 20. Beyond age 20, however, the use of time varies across countries. Childcare is the activity that demands most of women’s time, particularly during motherhood, and therefore it is the onset of this activity and the age-fertility levels what shapes time use for women at different ages. These findings reflect the slow pace of social change and, regarding the development level of the country, the gender role differentiation persists.